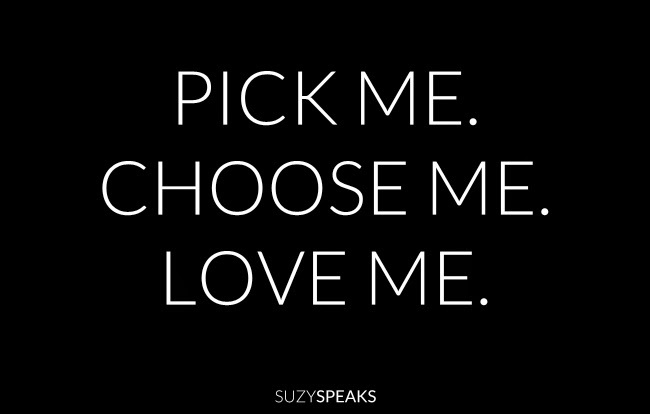 Suzy Speaks: Pick Me. Choose Me. Love Me. I love Grey's Anatomy, but Meredith... should we really be teaching women that saying, "Pick me. Choose me. Love me." is a good way to get someone to be in a relationship with you? I know this is fictional, McDreamy couldn't decide if he should stay with his wife Addison, and he loved both of them. I know these facts, but still. Should we really have to ask a guy to fight for us? Talking with friends, I sometimes feel like I'm living in Carrie Bradshaw's world of analyzing what you should or shouldn't do when it concerns men and relationships and the topic of wishy-washy relationship people comes up so often. I think you either want to be in a relationship or you don't. Am I being idealistic when I think that wanting to be in a relationship is so black and white? Do not mistake me. I'm not equating being in a relationship to being in love with someone. I think you can love someone and not want to be in a relationship. I think you can be in a relationship and not love someone. You can have one without the other. But why do we think we need to beg guys to pick us, choose us, fight for us? If someone wants to be in a relationship with you, then they will. They don't make up excuses as to why they can't or why it's hard for them. They choose to invest time in you because you are important to them. They choose you. They pick you. They make you a priority. I'm not saying that they drop their entire world and bow down to your every whim. But they make time for you in between hanging out with the guys and working on a big presentation for their boss. Think about it. When you view someone as important, like a friend for example, you make time for them. You choose to talk to them on a regular basis. You choose to see them. You make them a priority. It's logical. There's no grey area. They don't have to beg you to choose them and pick them because you do those things naturally when you want to have a relationship with someone. What do y'all think? Do you agree or do you think it's a little more complicated than just choosing to be with someone?